There are a variety of transportation options available to both travelers and locals exploring the beautiful city of New Orleans. Whether you are planning your first big trip to the city, or you are an expert traveler returning to New Orleans to visit one of the many attractions or festivals, you will be delighted with the number of convenient transportation options available to you! With the city’s temperate climate, walking and biking throughout the city is common, but other forms of transportation, like the streetcar and ferries, allow you to explore New Orleans with even greater ease. Located in the center of the French Quarter of New Orleans, the French Market Inn places you walking distance distance from numerous New Orleans attractions, restaurants, art galleries, museums, and more. You will be able to browse through famous New Orleans art galleries and antique shops, grab a delicious beignet at Cafe Du Monde overlooking the Mississippi River, and shop at the River Walk Mall and French Market in just minutes when you stay at the French Market Inn. If walking around the French Quarter isn’t quite your speed, several local companies offer bike tours of New Orleans, which is a great way to burn off all that delicious Creole food. In addition, you can opt for a pedicab, an easy way to navigate through the French Quarter and surrounding areas. Pedicabs are a great way to get back to the French Market Inn after a long day (or night) enjoying everything the city has to offer! 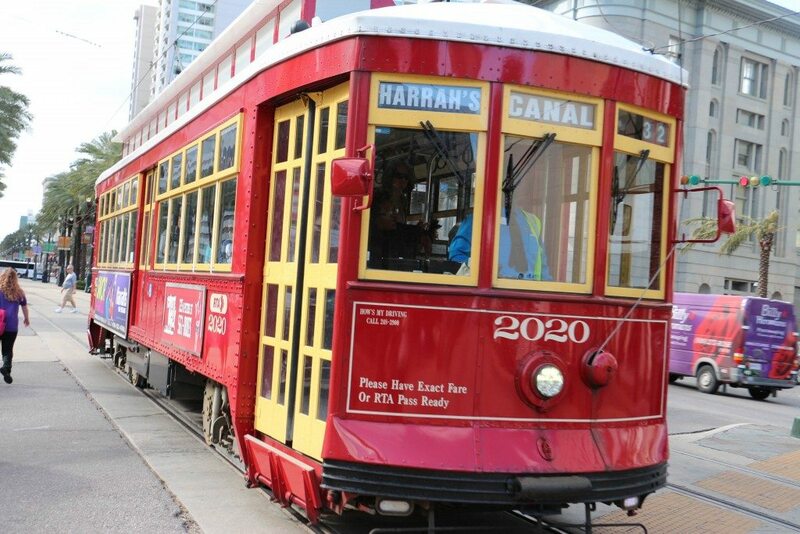 If you are ready to explore the rest of what this beautiful city has to offer, a great form of transportation close to the French Market Inn is the iconic New Orleans streetcar. The historic streetcar’s main lines include St. Charles, Canal Street, the Riverfront, Loyola Avenue/Union Passenger Terminal loop, and Rampart Street. Coming in at just $1.25 a person, the New Orleans streetcars are also a great value. Depending on the line, they will take you through the Treme, Central Business District, Garden District, and past the uptown universities. The line is located within easy walking distance of our hotel, so get exploring! 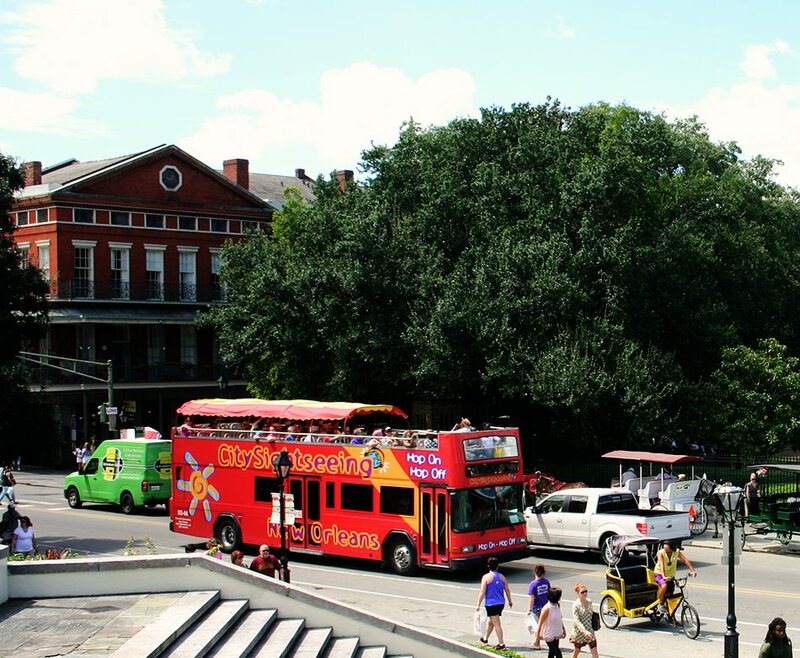 One of the most versatile and easy options for visitors to the city is the City Sightseeing New Orleans Hop-On, Hop-Off double decker bus tour! 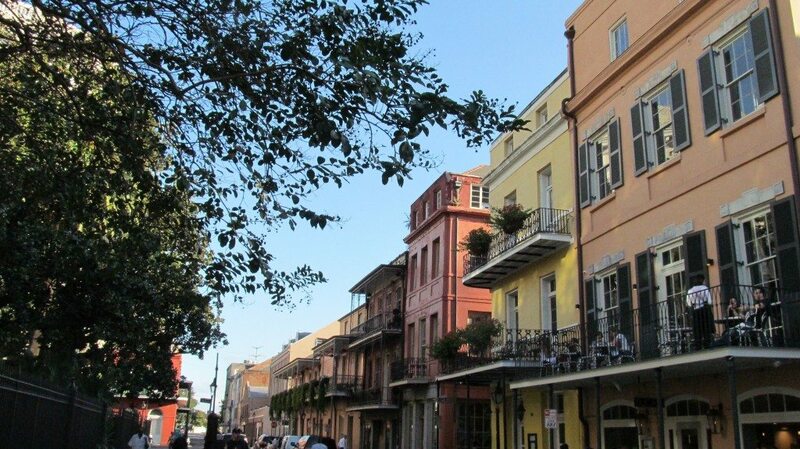 This fantastic tour is a nice way to travel from the French Quarter to the Garden District and Magazine Street shopping district, and your ticket also comes with three free walking tours. The buses come to each stop every thirty minutes, allowing you to travel and sightsee throughout New Orleans at your own pace. The buses run from 9:30 a.m to 5:30 p.m, all year long, and the experienced tour guides provide guests with interesting commentary and will answer any questions you may have. Plus, if you present your Hop-Off ticket, you can receive deals and discounts at various New Orleans attractions, restaurants, and gift shops along the route! If you have always loved the water and the history of the Mississippi, make sure to get a grande look at the mighty Mississippi in person and take a ferry ride on the Algiers Ferry. 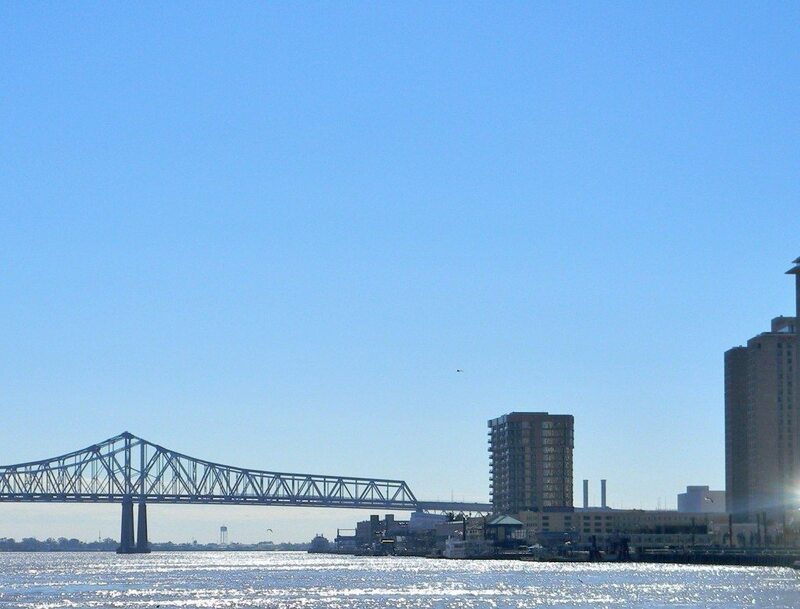 At only $2 a person, on this ferry ride you will learn why New Orleans is called the Crescent City as the ferry traverses the river’s natural crescent to historic Algiers Point on the West Bank. Once there, you can grab a bite to eat from a local cafe, stroll along the Jazz Walk of Fame on the levee, and enjoy the pleasant, residential neighborhood that has preserved much of its original 19th century village charm. The Algiers Ferry runs for a good portion of the day, but be sure to check their schedule for departure times. New Orleans also offers various taxi cab services, as well as Uber and Lyft. Uber and Lyft are the newest additions to the transportation scene in New Orleans. You can access these services using your mobile phone by downloading the app, but make sure you stay aware of prices during peak times and during popular events or festivals. Stay Close to New Orleans Attractions at the French Market Inn! 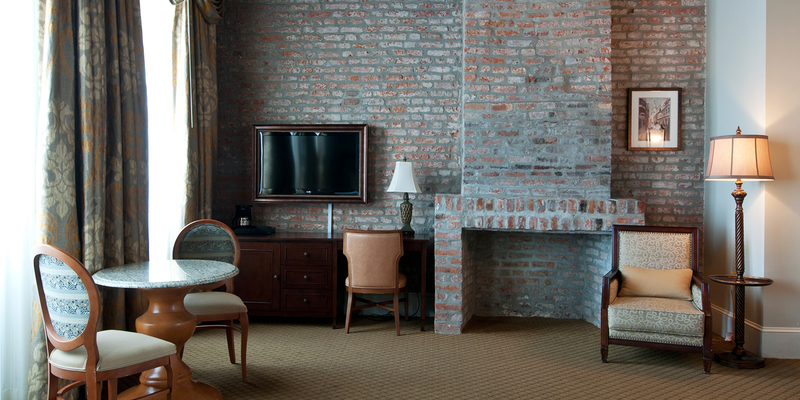 If you are planning a trip to New Orleans this summer, reserve your spot at an accommodating hotel close to tons of great New Orleans attractions, restaurants, destinations, and more. The French Market Inn is a historic New Orleans hotel located on Decatur street, walking distance from famous destinations including Jackson Square, The French Market, Bourbon Street, and more. It is also conveniently located near great transportation options like the streetcar and the Algiers Ferry, making it easy to explore everything New Orleans has to offer. Take advantage of the French Market Inn’s specials, group rates, and best rate guarantee for more savings! Reserve your spot at the French Market Inn today and get started on your New Orleans adventure!